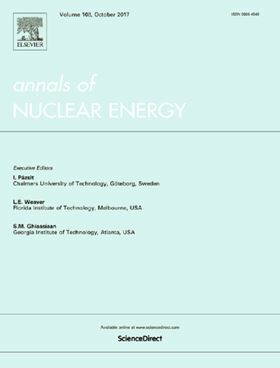 The research article 'Research on the non-uniform inflow characteristics of the canned nuclear coolant pump' has been published in Elsevier's Annals of Nuclear Energy. Computational fluid dynamics is used to analyze the velocity field of the inflow and the pressure loading on the blades of the reactor coolant pumps under different conditions. The Reynolds-averaged Navier-Stokes equations with the k-ε turbulence model were solved to simulate both steady and unsteady states of the inflows. The model was validated with experiments on the heads and efficiencies by testing a straight pipe at different flow rates. With this model, the paper demonstrates that, by replacing the straight pipe with a channel head, the inlet flow field of the impeller becomes non-uniform, forming a swirling flow under lateral pressure differences and a local low-energy region near the tube wall. The inlet distortion destroys the circular symmetry of the flow field and reduces the head and efficiency of the pump. The flow field in the impeller is more complicated and chaotic and imposes an unbalanced force on the impeller thus increasing the risk of fatigue failure of the impeller. Because of the significant effect of the non-uniform inflow induced by the channel head on the performance of the pump, understanding the underlying mechanism is of importance in improving the design of the reactor coolant pump. An innovative approach for modelling pumping tests in wells intersecting fractures is presented. A cooling water circuit consisting of 3 cooling towers in parallel, 2 cooling water pumps in parallel and 11 heat exchangers in parallel is modelled. A method using deep belief networks is proposed to detect multiple faults in axial piston pumps.